One of the things that many homeowners think about is whether or not their home has good curb appeal, meaning that it looks like a nice home when you first pull up and see it from the street. There are a lot of things that can go into creating curb appeal, including your home’s exterior material, windows, fresh paint, and more, but many people don’t realize that your Peachtree City roofing can also play an important role in the curb appeal of the home. A nice roof in good repair often draws little attention, which is good because it can help boost the appeal of your home, but Peachtree City roofing in disrepair is something many potential buyers will notice right away, and can bring down the perceived value. Here are some things to check for to ensure that your roof is helping and not hurting your home. Whether it’s due to age or exposure to harsh weather, your roof shingles will eventually start to come apart. It’s important to check your roof regularly, especially if your roof is more than 10 or 15 years old, so you can spot any missing or torn shingles early on and get them repaired before they become a bigger problem, or begin to leak. Having orderly shingles also helps keep your home looking nice. Flashing is the material used around items that stick out from your roof to prevent leaks, and it is usually made of metal. That means that over time as it wears out it could start to show signs of rust. A rusting roof is never a good thing for your home’s curb appeal, so if you see this, be sure to call Fayetteville roofing contractors to come and fix it. They are not technically part of your roof, but gutters and downspouts play an important role in channeling water from the roof safely away from the home and into the yard. If they are separated from the house in some areas, cracked, leaking, or just missing, it will look bad for your home but it also presents a danger that water coming off your Fayetteville roofing will start to pool up near your home’s foundation, which can put you at risk for floods and other damage. In addition to boosting your curb appeal, a roof in good repair also protects your home so it’s a great investment for any homeowner to make. 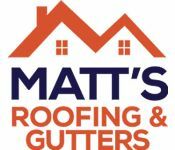 Whether you live in Peachtree City, Fayetteville or the surrounding areas, Matt’s Roofing & Gutters will not only be able to help improve your curb appeal with a new roof but also by replacing your windows, gutters and chimney caps.